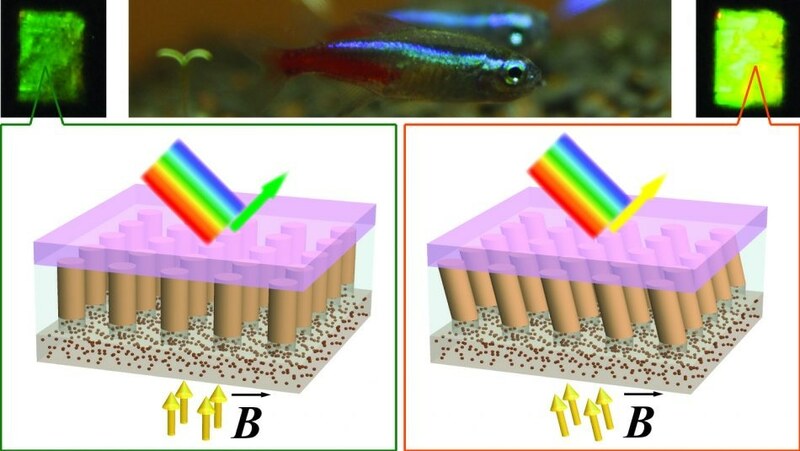 Scientists inspired by the neon tetra fish’s flashing colors have developed a method for changing the color of a material by controlling the orientation of nanostructured columns in the material. “Neon tetras can control their brightly colored stripes by changing the angle of tiny platelets in their skin,” says Chih-Hao Chang, an associate professor of mechanical and aerospace engineering at North Carolina State University and corresponding author of a paper on the research. For this proof-of-concept study, we’ve created a material that demonstrates a similar ability. Specifically, we’ve shown that we can shift the material’s color by using a magnetic field to change the orientation of an array of nanocolumns. Zhiren Luo, Paper’s First Author and Ph.D. Student, NC State. The color-changing material consists of four layers. A silicon substrate is coated with a polymer that has been implanted with iron oxide nanoparticles. The polymer integrates a standard array of micron-wide pedestals, making the polymer layer look like a LEGO® brick. The middle layer is an aqueous solution comprising of free-floating iron oxide nanoparticles. This solution is kept in place by a transparent polymer cover. When a vertical magnetic field is applied underneath the substrate, it draws the floating nanoparticles into columns, aligned over the pedestals. By altering the orientation of the magnetic field, scientists can alter the orientation of the nanoparticle columns. Altering the angle of the columns changes the wavelength of light that is most intensely reflected by the material; in real-world terms, the material changes color. You can change the baseline color of the material by controlling the array of the pedestals on the polymer substrate. Next steps for us include fine-tuning the geometry of the column arrays to improve the purity of the colors. We are also planning to work on the development of integrated electromagnets that would allow for more programmable color shifts. Chih-Hao Chang, Study Corresponding Author and Associate Professor of Mechanical and Aerospace Engineering, North Carolina State University. The scientists aim to achieve the goal of developing applications spanning from reflective displays to dynamic camouflage. The paper, “Magnetically Actuated Dynamic Iridescence Inspired by the Neon Tetra,” is published in the journal ACS Nano. Benjamin Evans of Elon University co-authored the paper. The research was carried out with support from the Defense Advanced Research Projects Agency, under grant W911NF-15-1-0108; and the National Science Foundation, under grant 1552424.